This popular advertising jingle for canned green beans from the mid-1960s became a regular rallying cry at Parkview High School for one of the most successful three-year runs in state basketball history. From the fall of 1963 to the spring of 1966, the Parkview “Jolly Green Giants”—as the team became affectionately known—went 81-4 and won the 1965 Class L state championship, while finishing runner-up in both 1964 and 1966. The Jolly Green Giants simply overwhelmed teams with a combination of athleticism, sound fundamentals, and depth, as the Parkview roster was stocked full of players who would earn All-State honors throughout the dominating three-year run. Harding deflected any praise for his teams’ accomplishments to his players, though. “When I went to Parkview, I laid out my philosophy and idea of what a program should be,” said Harding, who currently resides in Nixa. “It was based on being good citizens, good people, hard work, and fundamentals. The young men bought into it, and we began to assemble what we thought would make us a winner.” Harding guided the Vikings to a 22-5 record his first season, setting the stage and laying the groundwork for the run of success to come. The 1963-64 season was one of big change—at Parkview and in the area. Glendale High School opened its doors for the first time, and welcomed some former Parkview players through its doors in the process. However, Parkview welcomed O’Reilly to its school and team that year, as well. O’Reilly, who had led the city in scoring while a junior at St. Agnes (now Springfield Catholic), had lived in the Parkview district his entire life, and now would be joining forces with players he had grown up playing basketball with on area playgrounds. The 1963-64 team finished 27-2, with an average margin of victory of 21 points. 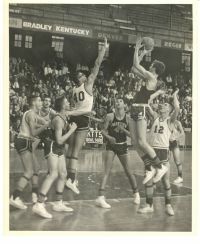 The Vikings lost in the championship game of the Tournament of Champions to Joplin, which was a major player in high school boys basketball in the mid-1960s. Parkview played Joplin a total of five times during the 1963-64 season, and won the other four match-ups, two of which were for Blue & Gold and Regional championships. The 1963-64 team rolled through the state playoffs behind a starting five that featured 1st-team All-Stater Steve Grace and Steve Cash at guard, and O’Reilly, Gail Fredrick and Jim McAlear (an honorable mention All-State player) along the frontline. The Vikings entered the semifinals of the state tournament with a 26-1 record, where Parkview would face top-ranked Maplewood-Richmond Heights at Washington University Fieldhouse in St. Louis. “Maplewood was big, strong, and very physical, and had mowed down everyone all season,” said O’Reilly. Parkview played a strong first half, though, and jumped out to a 16-point lead at halftime. In the halftime locker room, though, Coach Harding was less than pleased, and perhaps a bit too into the game. “Coach Harding starts in on us about missing screens and blocking out,” said O’Reilly. “I said, ‘Well, Coach, we’re up by 16 points.’ Coach Harding said, ‘No, we’re not. We’re up six points.’ He then turned to an assistant coach, who confirmed that we were actually up by 16 points. He had gotten so into the game that he didn’t realize we were up by 16.” Parkview would go on to dispose of Maplewood by a 71-64 score, advancing to the state championship game to face St. Louis Bishop DuBourg, which had upset second-ranked Kansas City Central in the other semifinal. Bishop DuBourg rode an all-time performance by seven-footer Rich Niemann to a shocking 62-52 upset of Parkview in the state championship game. Niemann, who would go on to star at St. Louis University and later play four years in the NBA and ABA, scored 40 points in the state championship game, after averaging 26.48 points per game during the regular season. To the members of the Jolly Green Giants, though, the sting of defeat and the sands of time have caused the point total to grow to legendary status in the years since the disappointing defeat. The loss merely served as added motivation for the remainder of the season. The Jolly Green Giants began piling up wins in the regular season, which included a perfect Ozark Conference record, a victory over Glendale to capture the Tournament of Champions, and a 51-45 overtime victory over small-school power Buffalo to win the Blue & Gold Tournament. 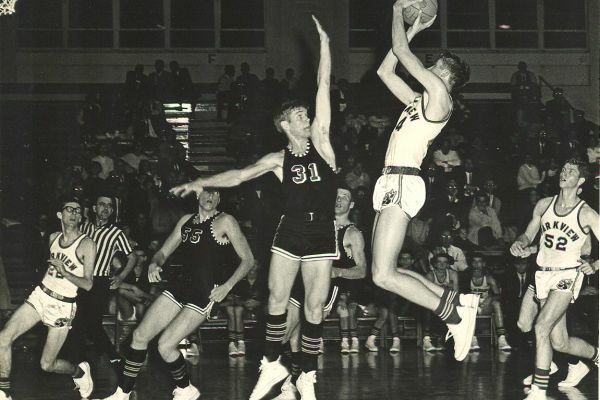 The Jolly Green Giants entered the Sectional round of the 1964-65 state tournament with a 23-1 record, where the Vikings faced off against a familiar opponent in Glendale at McDonald Arena. “Our biggest worry was the local teams,” said Harding. “Glendale just played the stuffing out of us in the Sectional. Once we got away from Springfield, things got easier for us.” Parkview won the hard-fought game over Glendale by a 47-38 count, and advanced to the state quarterfinals, where the Vikings defeated Columbia Hickman 61-40 to return to the Final Four at Kiel Auditorium in St. Louis. Once again, the Jolly Green Giants lost a lot of talent to graduation following the state championship season, but simply reloaded for another state tournament run in 1965-66. However, the Vikings would have to navigate the title defense without their trusty leader. Coach Harding left Parkview following the 1964-65 season to become the men’s head basketball coach at Drury University. Harding was replaced by Bob Brown, who would amass 367 victories at Parkview from 1965-86, on his way to a Hall of Fame coaching career. The Jolly Green Giants ran the table in the regular season and, coupled with the 23-game winning streak to end the 1964-65 season, entered the Regional round of the 1965-66 state playoffs riding a 46-game winning streak. The unbeaten regular season, which once again included Ozark Conference, Tournament of Champions and Blue & Gold Tournament titles, remains the only undefeated boys basketball regular season by a Springfield R-12 school. In the Regional round, Parkview survived a scare by Joplin, escaping to the Sectional round with a 56-55 victory at McDonald Arena. The Vikings knocked off Glendale 48-41 in Sectional action, and survived another scare by Mexico in the state quarterfinals, winning 64-62 to make yet another trip to St. Louis for the Final Four. 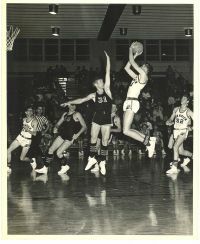 In the state semifinals at Kiel Auditorium, the Jolly Green Giants dominated St. Louis Lindbergh by a score of 76-44, and carried a 50-game winning streak into the state championship game against Kansas City Central, a team the Vikings had already beaten by 21 points earlier in the regular season. However, Central ended the Vikings’ winning streak at 50 games and, more importantly, denied Parkview a second-straight state championship with a stunning 52-48 upset. “We went into the game way overconfident,” said Virgle Fredrick, who was named 1st-team All-State that season. “We were a team that ran a full court press and played tough, pressure defense. We didn’t start the game in the full court press, though. You think in retrospect…who knows? The bottom line is we didn’t play up to our potential. We expected to win every night, and not being able to complete the deal left a bittersweet taste.” Steve Hutchinson and Ray Snelling joined Fredrick on the All-State team, with both receiving honorable mention honors. Although Parkview would win back-to-back Regional titles in 1967-68, the Vikings lost in Sectional play both seasons. In fact, Parkview has only advanced to the state quarterfinals three times since the days of the Jolly Green Giants, and have only reached the Final Four once, finishing in third-place at the end of the 1980-81 season. The three-year run by the Jolly Green Giants, which included a record of 81-4, a state championship and two state runner-up finishes, leaves some wondering how those teams would fare in today’s game.